The ECM-3612 SBC – a processor-intensive solution. 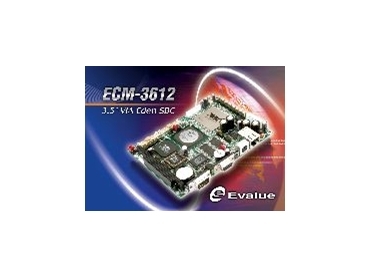 EVALUE Technology has launched the ECM-3612 single board computer, specifically designed for low profile, fanless applications. The compact 3.5" embedded micro board incorporates a passively cooled, low power VIA Eden 1GHz/667MHz processor, along with 128MB SDRAM onboard. By integrating the CPU and memory onboard, ECM-3612 significantly reduces the system's total cost; furthermore, this also prevents the components from loosening under heavy vibration, and enhances the system's reliability. The VIA ESP10K processor consumes seven watts of power only and eliminates the need to employ a CPU fan in a system. Along with integrated 2D/3D graphics, audio, LAN and four serial ports, these combinations provide a processor-intensive solution for demanding applications in industrial automation, POS, transportations, and embedded controllers. Its VGA function, with up to 32MB of shared memory, is built-in to the VIA VT8606 TwisterT chipset that is capable of simultaneously displaying on CRT monitors and 18-bit dual channel LVDS LCD panels. Onboard AC97 Codec sound chip provides a stereo, full duplex multimedia environment, while integrated Realtek RTL8101L chipset offers 10/100 Base TX fast Ethernet function. Additionally, this board shares similar component placement and functionality with ECM-3610, thus offering a smooth transition opportunity for the current users of ECM-3610. ECM-3612 contains a mix of I/O functions which includes two USB 1.1 ports, dual-enhanced IDE ports, one FDD interface, four serial ports, one parallel port and one IrDA port. Additional hardware can be utilised via onboard PC/104 expansion slot, while a CompactFlash socket is available for optional storage configuration. It runs Windows CE.NET, Windows XP Embedded, Linux and other x86-compatible operating systems such as VxWorks and QNX. With its small-footprint and low power design, ECM-3612 serves as a cost-effective solution for a number of industrial and commercial applications such as Panel PC, POS, KIOSK, and thin client.